While updating Whitney's progress as much as I can I will also have an image gallery that will be displayed here above the most recent entry. 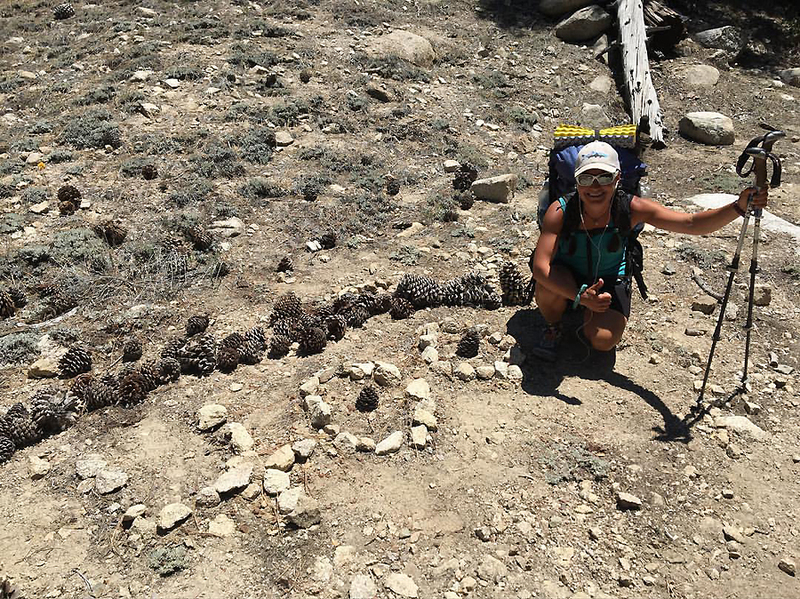 It will be updated ever few hundred miles in the table below as she continues her PCT hike. Tuesday, August 30th - Friday, September 16th (Day 134) - Mile 2,650: Canadian Border - FINISHED! I walked over the border at 9:01 this morning. I haven't eaten since then. I'm going to eat now. Peace, Love, and Honey Buns! Mt. 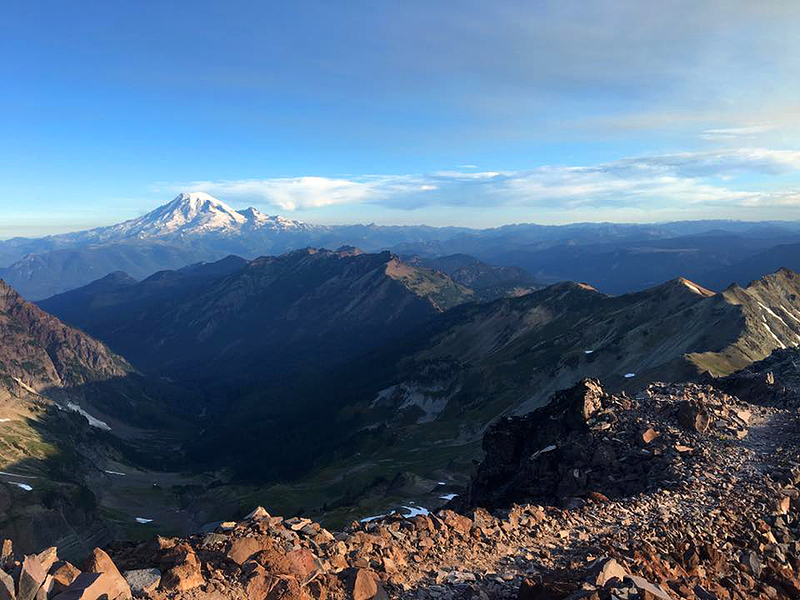 Rainier as seen from the Knife Edge in Goat Rocks Wilderness. I could stay here forever. 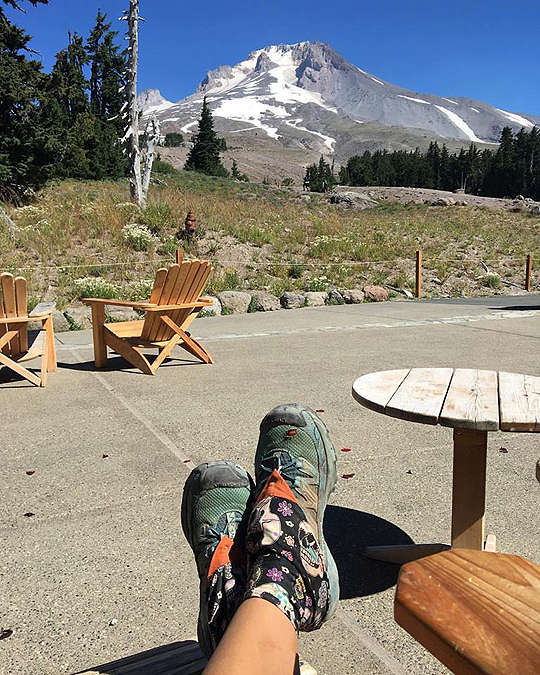 Whitney relaxing at Timberline Lodge after a huge breakfast before heading back on trail for a few low mileage days (for her) as she makes her way to Cascade Locks. Relaxing in an Adirondack chair looking at beautiful Mt. Hood after stuffing my belly full at the AYCE brunch buffet. Life is good! 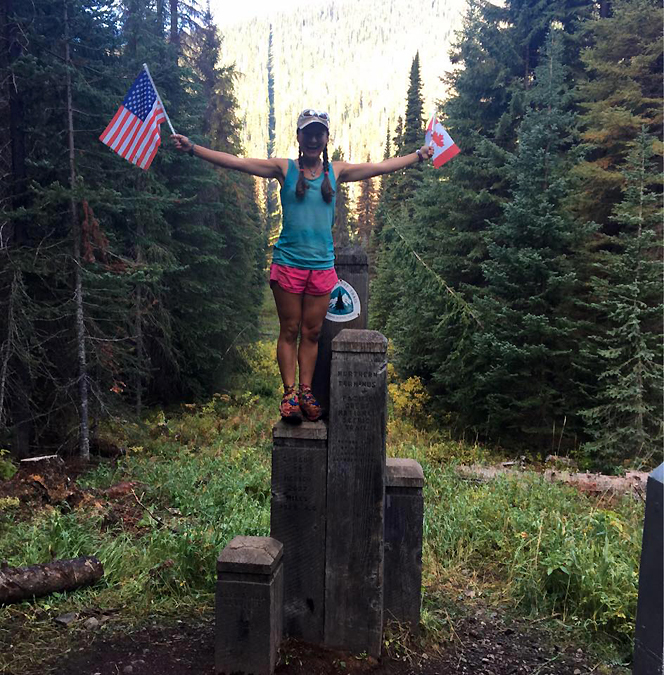 Whitney Makes her way into Bend, Oregon for a nice zero day, one more week until Washington! Whitney takes only here second zero day in 1,100 miles in Ashland Oregon before continuing north towards Crater Lake. Crater Lake had a fire burning and the PCT was closed off for a few days but Whitney lucked out and they reopened it the day before she reached there! "Well hello there Oregon! It's nice to finally meet you!" 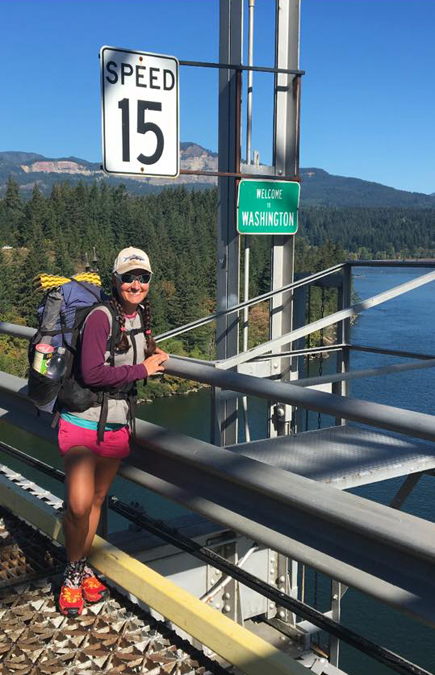 Whitney spends ten days hiking towards in northern California as she closes in on Oregon! The trail is still beautiful but it's a little overgrown with Poison Oak everywhere off trail, there's a nasty heat wave, and there's bees everywhere that buzz around constantly when she takes snack breaks! 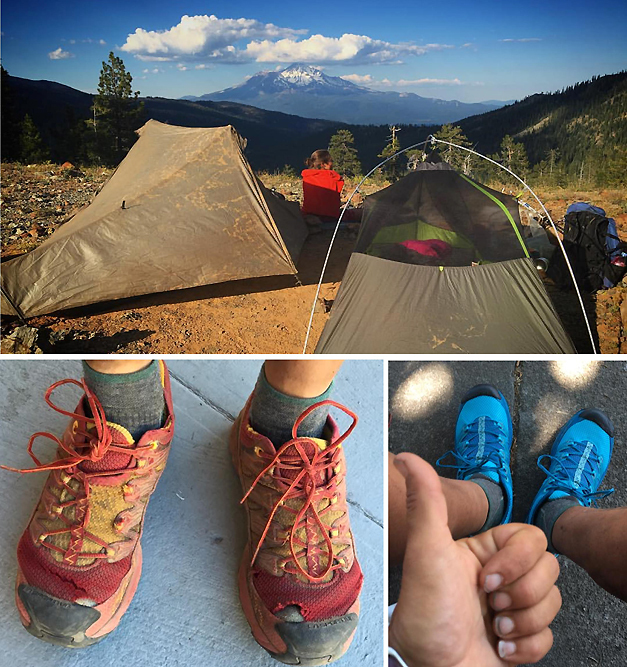 Her La Sportiva Raptors made it 800 miles since the end of the desert, probably about 200 miles too many so she was very happy to get new shoes in Dunsmuir before heading back out on trail. 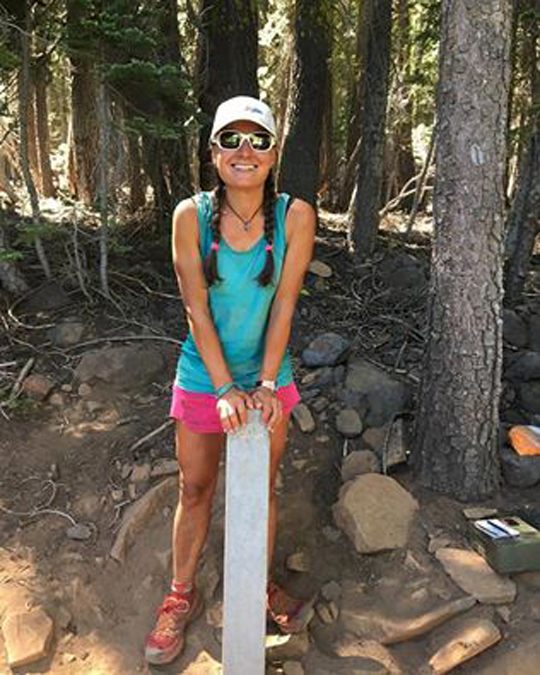 Whitney makes it to the halfway point on the PCT before heading into the small town of Chester, CA. Whitney makes her way from Lake Tahoe to Sierra City, Mile, 1195. Along the way she gets some much appreciated trail magic, only the fourth time she's received trail magic over her hike, much different compared to the first thousand miles of the Appalachian Trail where there was a decent amount of trail magic along the way. Luckily she has plenty of food and water but she definitely appreciates the very kind offerings. "It was a rough start to the Sierra's for me. I battled a stomach bug/food poisoning from night one and was barely able to eat all week. And to boot, my body refused to acclimatize to the elevation which left me nauseous and out of breath even on the flats. 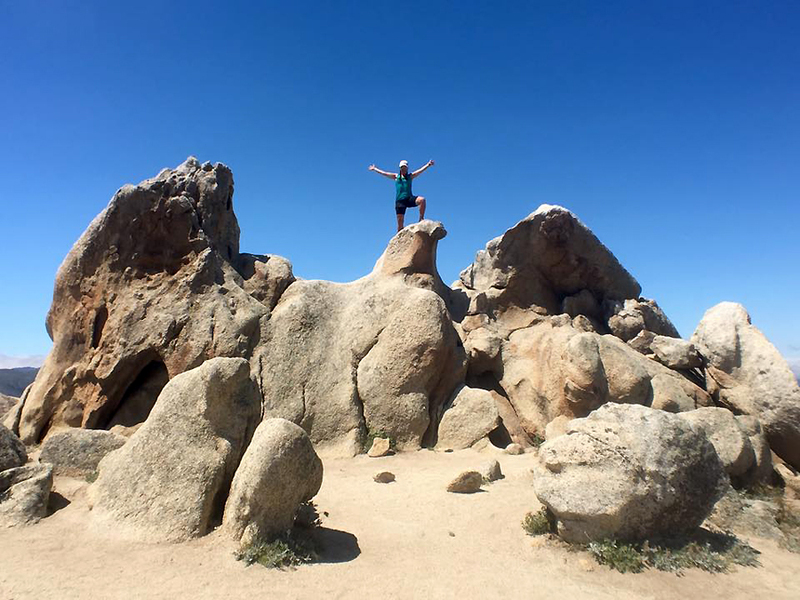 I pushed through though and managed to summit Mount Whitney (the highest point in the contiguous United States at 14,496 feet) and then made it over Forester Pass the next day (the highest point on the PCT at 13,000ish feet). In town now to resupply and rest before heading back out to tackle the remaining 200ish miles of the Sierra." 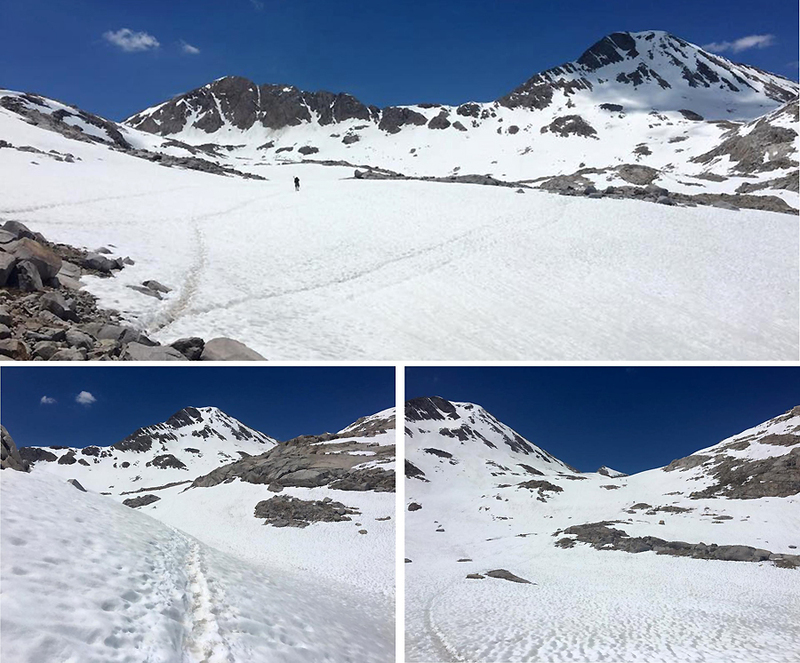 Whitney makes her way past Forester Pass, the high point of the PCT at 13,153 feet (top). 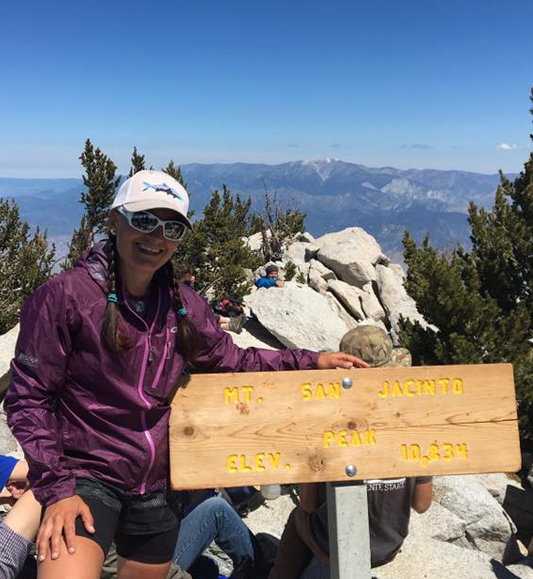 She also makes a side trip off the PCT to summit Mount Whitney, the highest summit in the contiguous United States at 14,505 feet. While makes her way into Kennedy Meadows and through the desert!!! "Goodbye SoCal desert and HELLO SIERRA!!! W00TTTTTT 😁😁😁"
Whitney stayed at the campground near the road that leads into Lake Isabella. 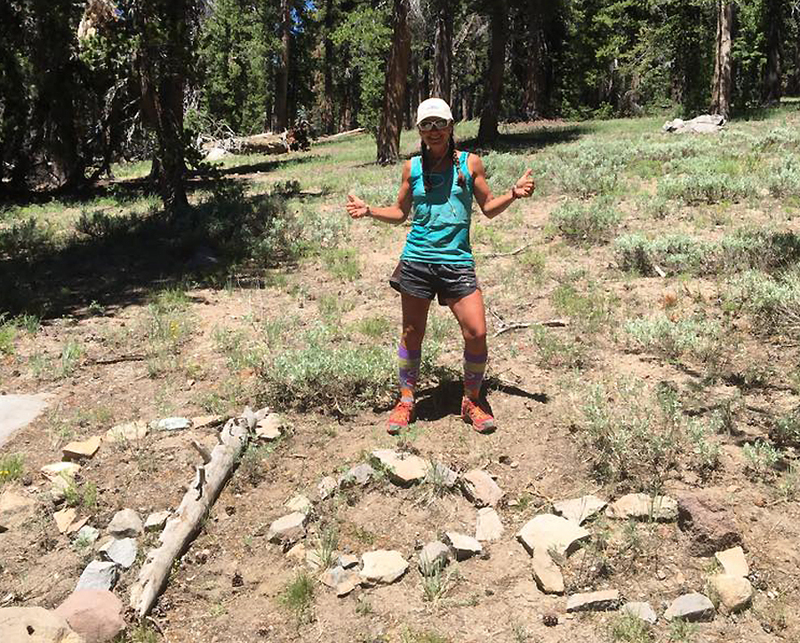 She started hiking early this morning and is hoping to make it to Kennedy Meadows by Friday. "Looking at the Mojave right now." "In Lake Isabella doing laundry and eating bananas like a mad woman to up my potassium level. It's still hot. Really hot. Just 2 more days and I'll be in the Sierra Nevada where there is snow and plentiful water. Can. Not. Wait. ✌🏼️ "
"In case anyone was wondering how hot the desert is during a heatwave...it's really hot 🔥☀️🔥. Only a couple more days till the snow covered Sierra! :)"
A wildfire in the desert just 100 miles north of Tehachapi put Whitney on the sidelines for three days. It was a mixed bag as the three days off helped her rest her feet but being stuck in hiker limbo gets stressful as she waits to hear if she could continue on, have to be shuttled around the fire, or deciding whether she should flip-flop and get a bus up to Oregon and hike south back to Tehachapi then flip back up. 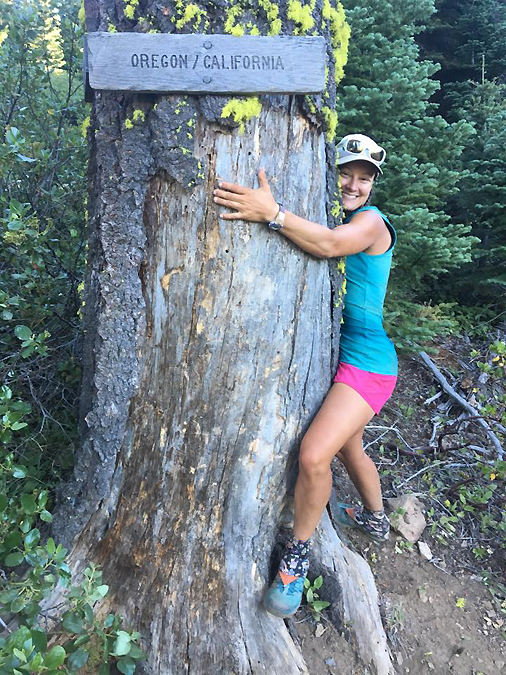 Luckily by Friday morning there was good news as the fire was being contained and her trail family and her set off late Friday afternoon to start heading north. Most likely she'll have to be shuttled around a section north of Lake Isabella to Kennedy Meadows but at least she's back on trail. 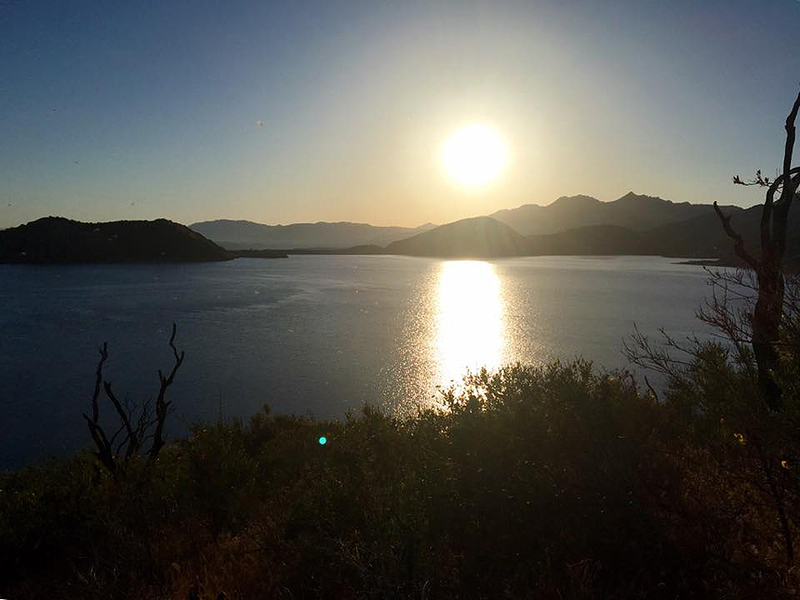 A heat wave has stubbornly moved into the desert with highs hoovering around 120 degrees so she's been hiking from 3:30AM to around 10AM, taking a siesta, then continuing on. It's been a rough week with the fire and extreme heat but she's still going strong as she passes miles 600. Whitney hikes the California Aqueduct portion of the desert, not the most attractive part of the PCT and very exposed to the punishing sun. Her trail family and her got up extra early to bang out miles before the extreme heat moved in. They made it to Tehachapi on Memorial Day and are taking a well deserved couple of days off before continuing on. 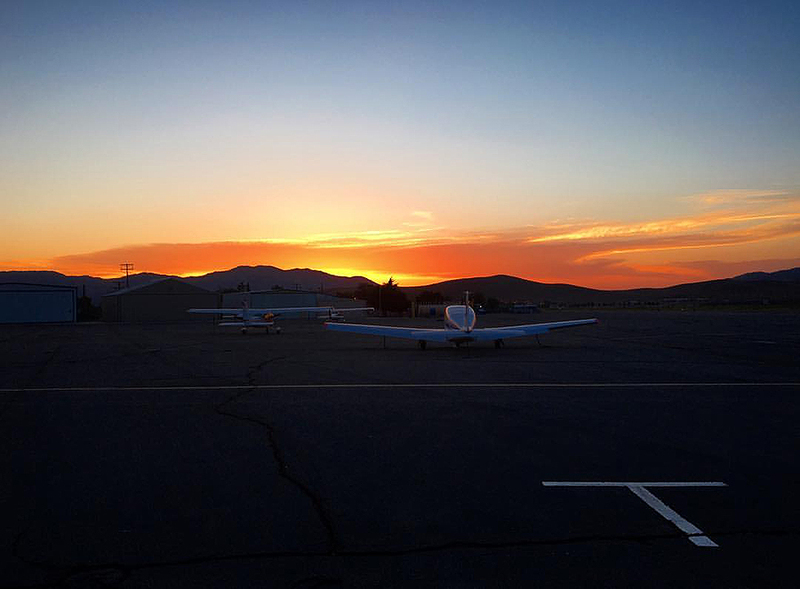 "Sunset over the mountains as seen from the runway at the Tehachapi Airport. I have hiked 558 miles in 27 days so now it's time to take a couple days off. 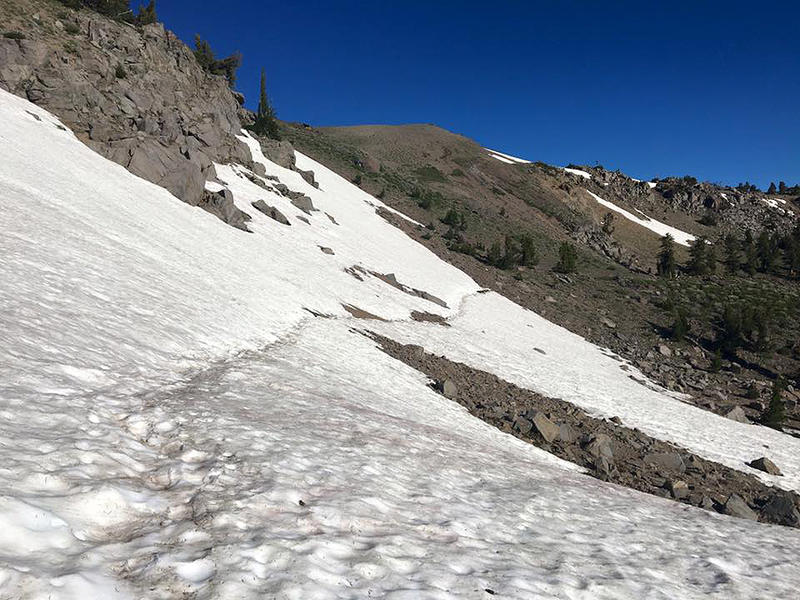 The next 135 miles of trail is the most barren, hot, and exposed section of the desert part of the PCT and as luck would have it a heat wave is rolling in." Whitney passes by mile 500 on her way to Hiker Town. She is moving pretty quickly through the desert, 200 miles to go, getting early starts to put in big miles before the extreme heat of the afternoon. Hiking in the dry heat is much more taxing than hiking back east where there is humidity. 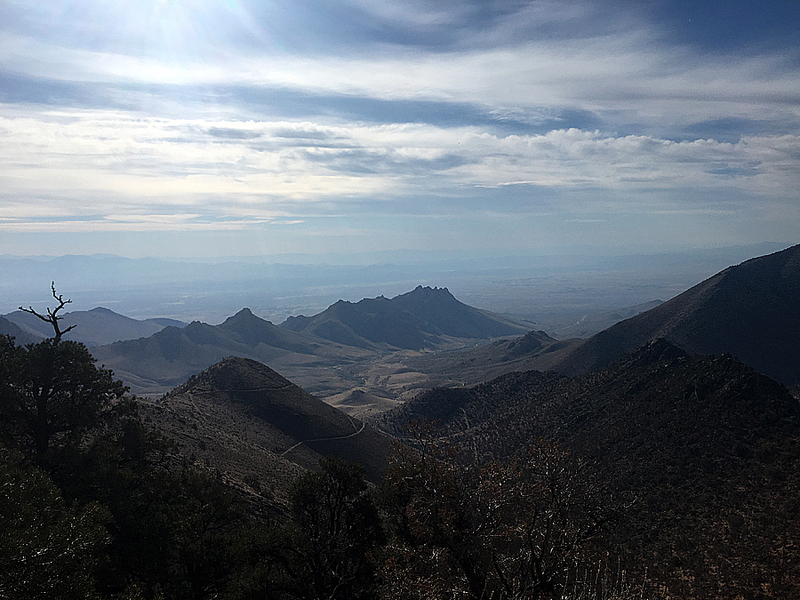 The dirt and dust sticks to your skin and you have a constant filthiness feeling while hiking, a different kind of filthy than hiking the Appalachian Trail! 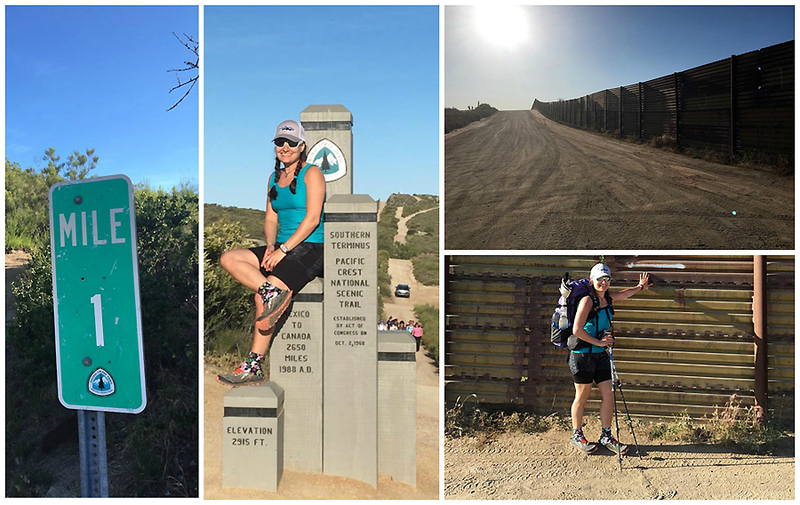 On Sunday Whitney celebrated her birthday by hiking over the summit of Baden-Powell, followed by a couple of thirty mile days as she made her way past mile marker 400 on her way to Agua Dulce, mile 454, for Wednesday evening. 400 down, 2,250 to go! 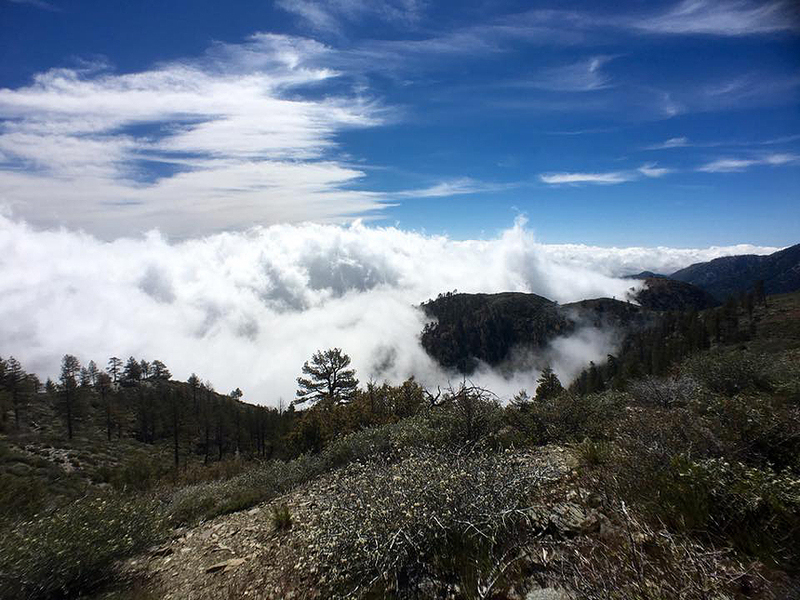 On Friday Whitney and her friends made it into Wrightwood after two days of battling cold temperatures and high winds, she said it reminded her of hiking back home! Saturday Whitney is taking a zero day to rest her feet after a week of big miles which beat her feet quite a bit. Tomorrow after a hearty breakfast her and her trail family will be back on trail. She is around mile 369 and just over halfway through the desert which is the first 700 miles. As much as she's enjoying the hike so far she and most hikers are looking forward to the end of the desert. "When you hike 11 miles through wet misty cloud then break through to the other side"
Whitney made it to Cajun Pass (Mile 342) around 12PM to fill up on fast food and take a Siesta. There is no water for the next twenty-eight miles so she'll be refilling everything. After a much needed rest for a few hours she'll set out this afternoon for some more hiking until the next spot to set up camp. It's another beautiful day in Cali...and McDonald's is just 5 short miles away! 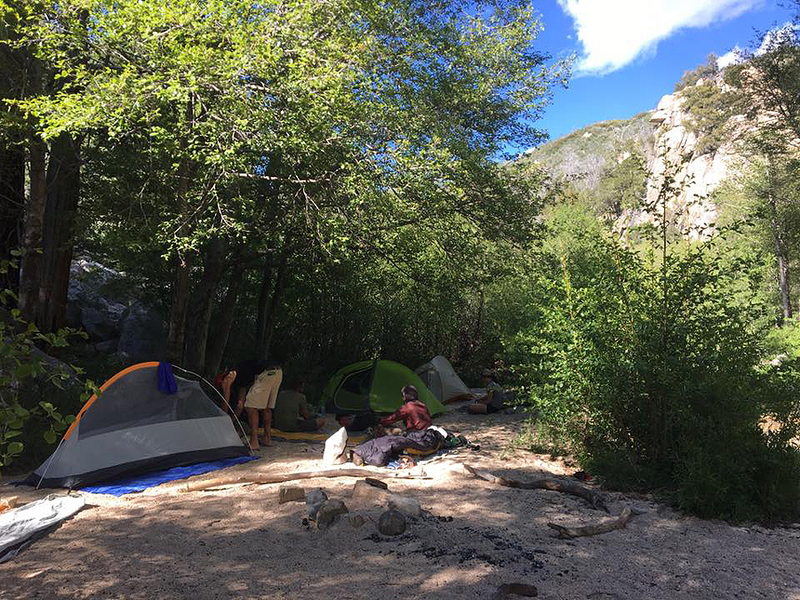 "We found the most amazing campsite by the river after hiking in the desert all day!" 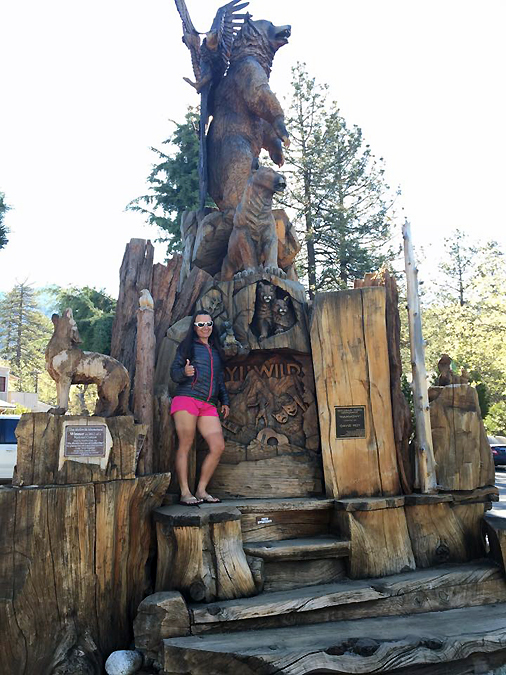 Whitney and her trail family got an early start to the day by catching the bus to Big Bear. Not a big day of hiking as she had to pick up a mail drop and hit the grocery store. She said the weather has turned cold again but it beats the extreme heat. After a zero day she hit the trails once again, this time going over 10,000 feet in elevation for the first time while summiting San Jacinto. 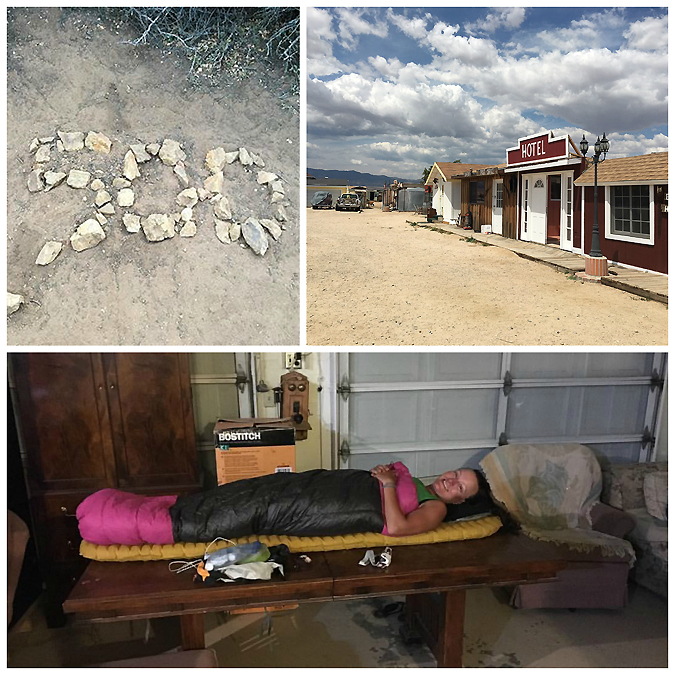 On Sunday she passed by mile marker 200, "Camped at 7,800 feet then descended this morning to the desert floor. It was incredibly windy today which made the last 5 miles to Ziggy and the Bears pretty brutal as the wind pushed us around and blasted is with sand every which way. Will be shuttling out first thing in the morning up to Big Bear Lake to resume hiking . Life is still good." 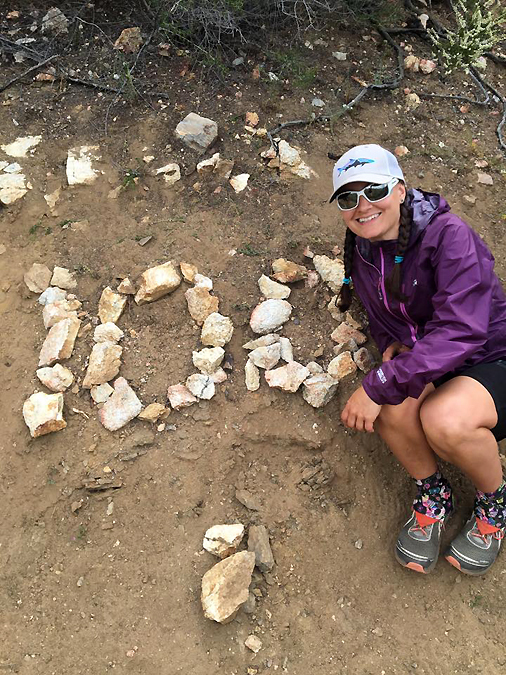 On Thursday morning Whitney left Paradise Valley Cafe and started heading towards her next target of Idyllwild where she ended up taking a zero day on Friday. She said Idyllwild was a beautiful little town that was filled with really nice people who were more than accommodating and friendly to PCT hikers. "I'm winning the tan line competition"
Whitney was able to hitch back from Lake Henshaw to the trail with the other six hikers she has been hiking with around 8AM Pacific Coast Time. Since then she has been out of cell range so no updates. The weather has turned hot so most likely her group has been hiking until noonish, followed by taking a siesta for a few hours, then hitting the trail again at 4ish and hiking into the night until they get their twenty plus miles in for that day. She texted me around 9PM and was heading to Paradise Valley Cafe at mile 152. 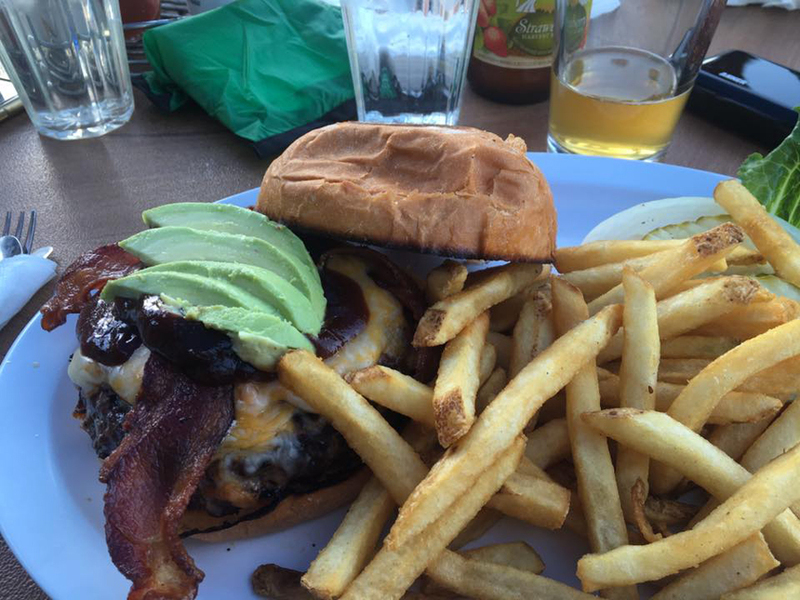 Wednesday 9PM : Mile 152 Paradise Valley Cafe - Burger Time! Whitney makes it to Warner Springs at mile 109.5. 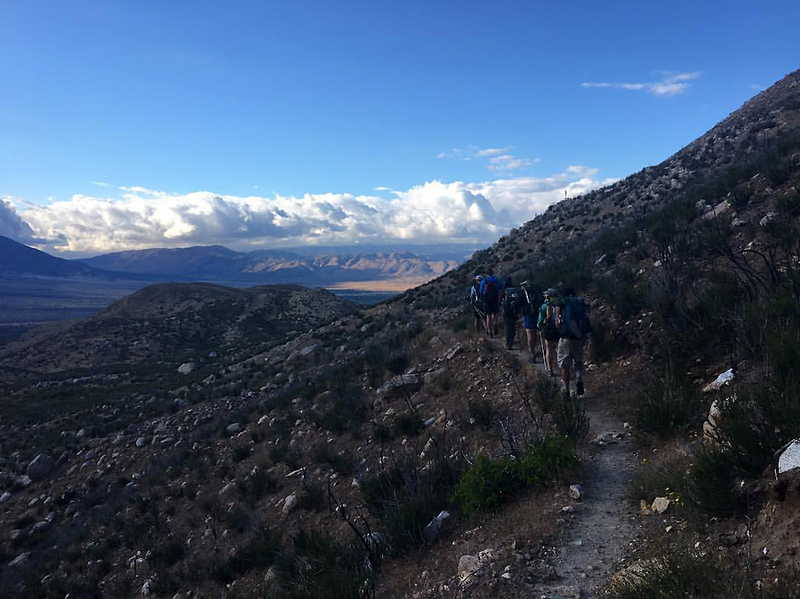 She and six other hikers hitched twelve miles from the community center at Warner Springs to Lake Henshaw to stay at a cabin in order to have a nice 'comfy' bed for the night. Tomorrow morning she'll be back on the trail as early as possible! "Woot!!! I need a shower . . . badly." 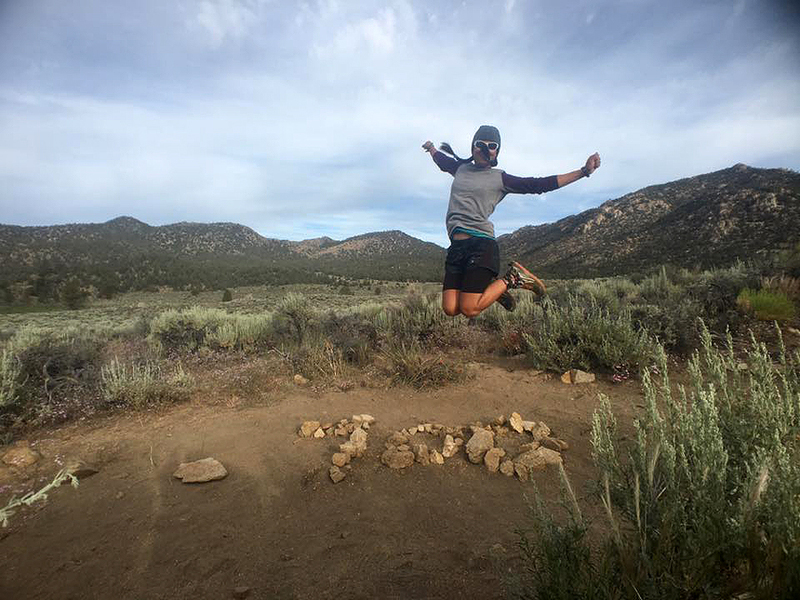 Whitney started the morning at mile 72 with the goal of making it to Warner Springs (mile 109.5) by Monday afternoon to pick up a mail drop, shower, and do laundry. Today she expects it to be very hot out as she has a long, dry, hot climb ahead of her. On the phone she said the views are consistently breathtaking, and while she is sore from big miles with a heavy pack she says so far the trail has been 99% dirt, much easier footing than the ruggedness of the Appalachian Trail. "Setting off on a little night hike after a 20 mile day. Gotta hike when the sun is weak out here in the dessert." "Closing in on mile 100 and Warner Springs! Life is good." 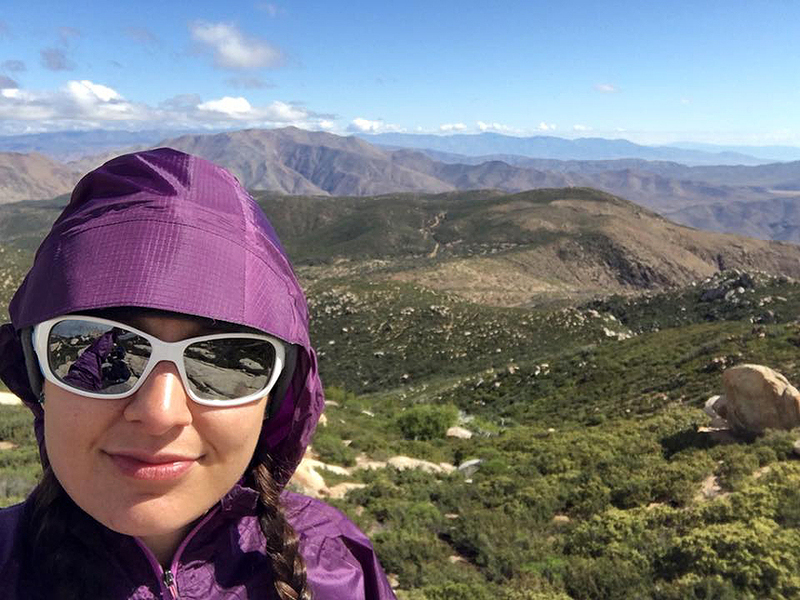 After staying near lake Morena on Wednesday, the weather turned cold and windy on Thursday as Whitney made her way north toward Mount Laguna. Friday the skies opened up and it rained as she reached Mount Laguna Lodge. The weather called for thunderstorms so initially she was going to do a 'work for stay' at the Mount Laguna Lodge, this is where you do some side work at the lodge and they let you crash in the dining room. However, there ended up being a 'hiking bubble' of about forty hikers that came through and she really wanted no part of that. A hiking bubble is when a big crowd of hikers travel together, while it's not too bad later on along the PCT as numbers thin out, early on there are quite a few non-serious hikers, partiers, and plain old weirdos! 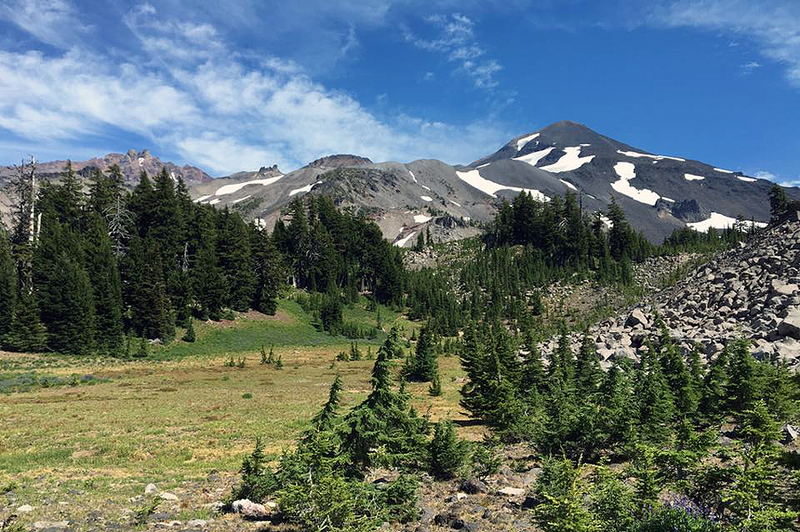 Luckily, in the early afternoon there was a break in the weather so she packed her gear and headed about six miles up trail to a campsite. As of Saturday morning Whitney was passing by mile 56 near Julian, California . . .
"Mile 56. It's still mother f***ing cold but at least the sun is out! This trail is unbelievably beautiful and yes the desert is cold! I will post pics as soon as I get to a place with wifi." 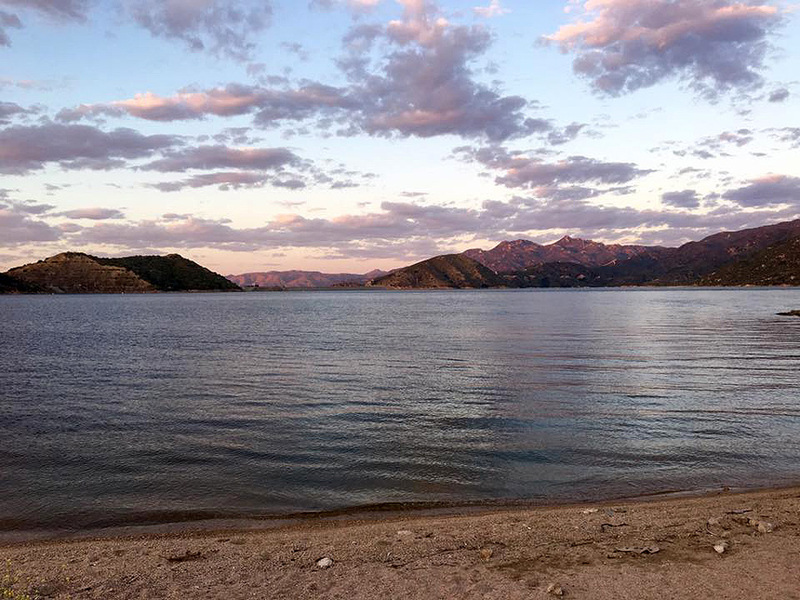 Whitney's first day on the PCT had her hiking twenty miles from the Mexican border (Campo, CA) to Lake Morena. Her first seven hundred miles is desert hiking under the punishing sun while hiking through dirt and dust! 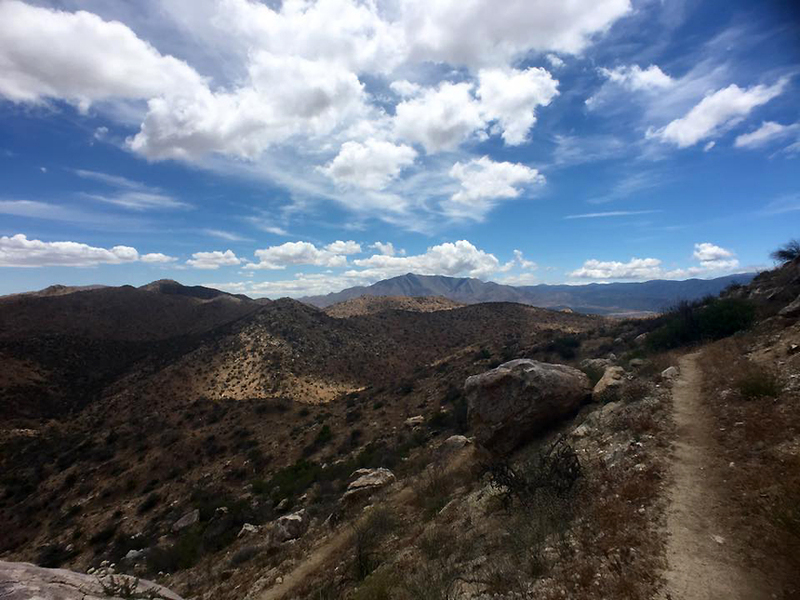 On Wednesday she traversed the rolling hills of Hauser Mountain and into its canyon before descending to Lake Morena. I'll be updating this page on my blog as much as I can throughout her thru-hike. Whitney has spent a lot of time preparing for her hike beforehand by going through her mileage maps to figure out how many mail drops she will need. Having already thru-hiked the Appalachian Trail in 2014 she mostly knows what kind of food she will desire over the long trek. Over the past few weeks she has spent hours upon hours preparing her food and supplies, this includes making freeze dried meals for her entire hike, picking up a variety of high-calorie snacks, powder for beverages, first aid, gear, etc, followed by packing flat rate boxes for me to mail out in the future for her to pick up along the way in trail towns. 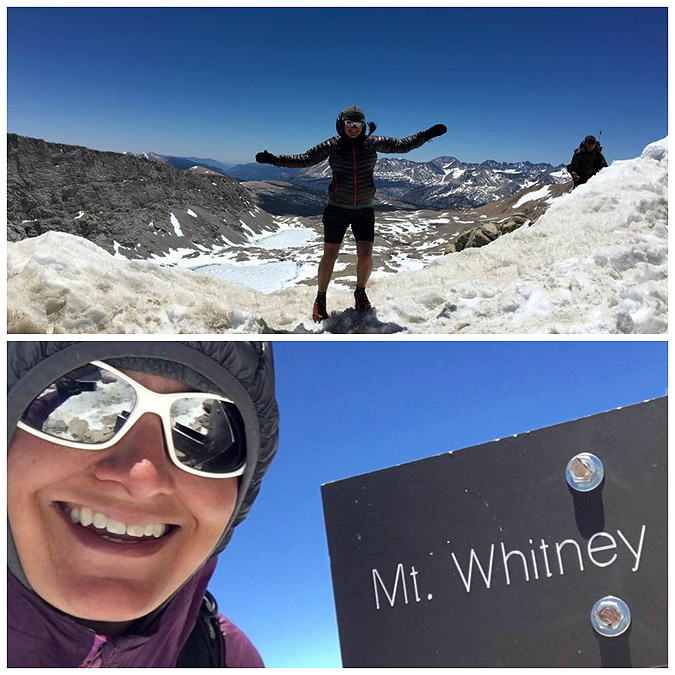 Below are a few pictures of what she has been doing over the past month to prepare for her upcoming hike with commentary from Whitney. 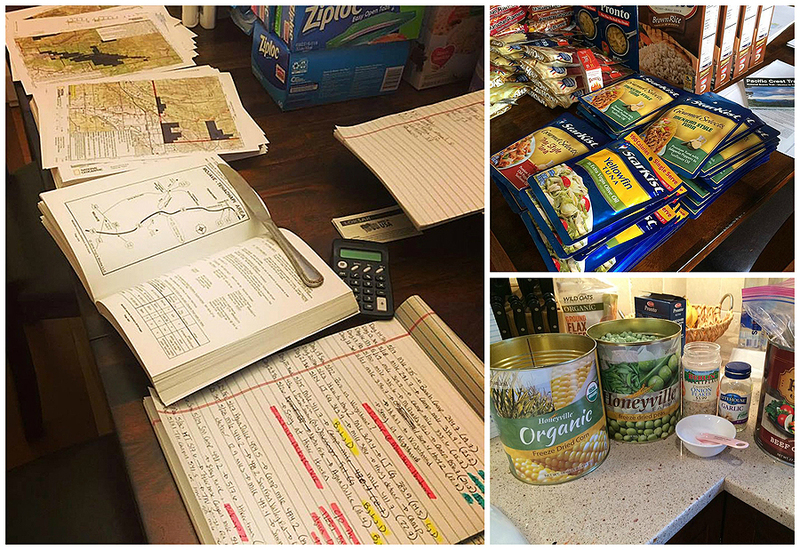 Maps, guidebooks, notes, and purchasing food. Figuring out my mail drop locations for my entire hike. This is the not fun part of planning a long distance hike, it's a bit of a logistical nightmare at times actually. 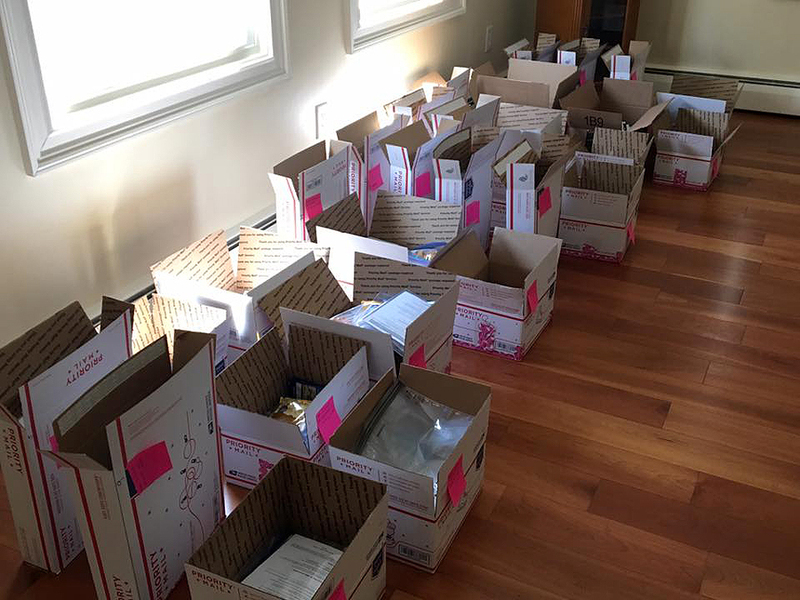 So much so that for my AT thru I chose to resupply as I went, not a single box sent to myself. I feel like I'm back in college and cramming for a big exam! Tomato powder, powdered cheese, salt, oregano, basil, freeze dried garlic, brown rice, and freeze dried chicken equals Trashy Chix Italiano. 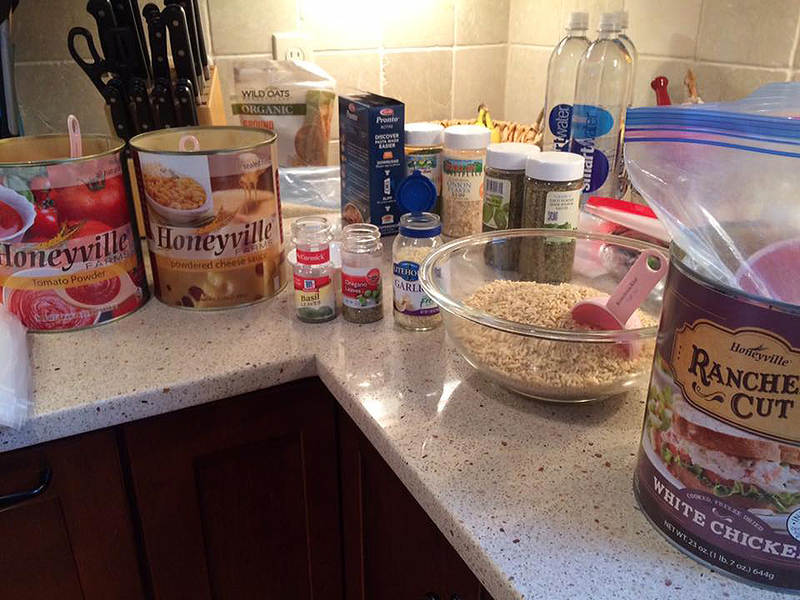 I'll add EVOO on the trail for more fat and calories. Sealed, dated, labeled and ready to go into the freezer until shipping time! 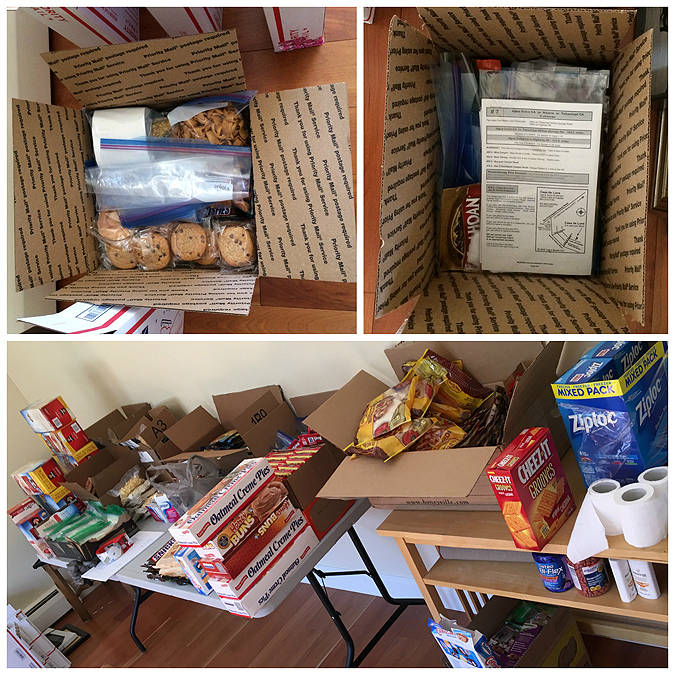 Packing 34 boxes is very time consuming, each box has an assortment of food, first aid & hygiene supplies, along with sections of maps with info from the PCT guide book. 4.5 months of food in 34 boxes! 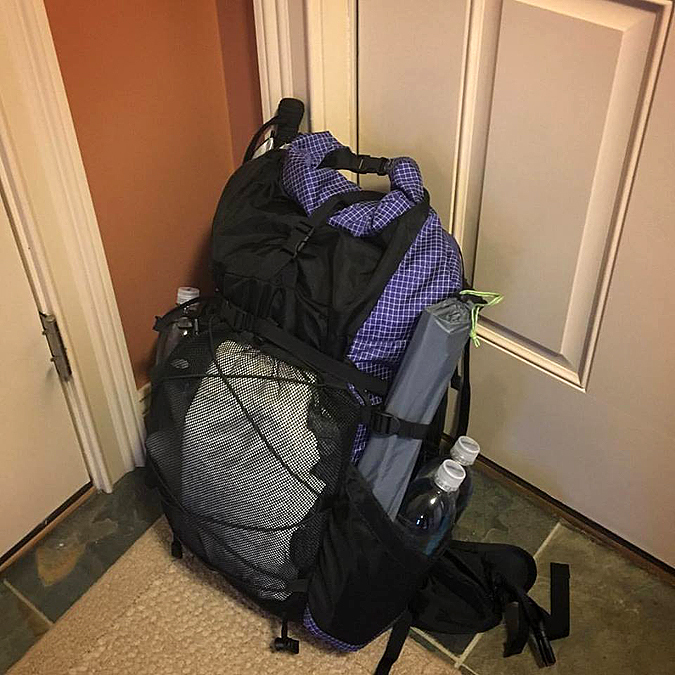 All packed up and ready to go...on a shakedown hike that is! I'm really curious to see how this pack feels loaded up. I really want to love this pack so I hope all goes well today. 16 miles with a bunch of PUDs and water crossings should be a good test! You are amazing, Whitney! So proud of and excited for you! 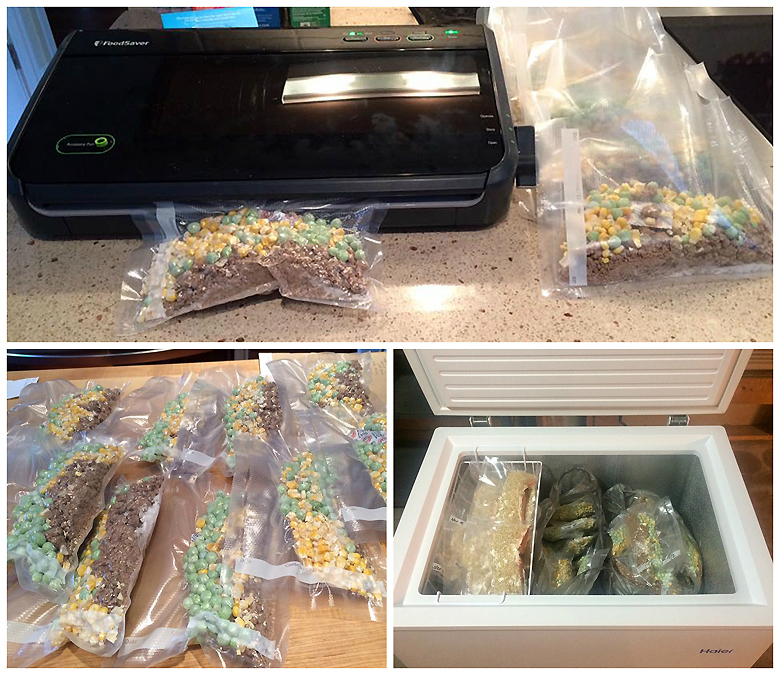 Amazing what goes into the preparation and logistics before you even set foot on the trail. I know that it will all pay off when you're out there. I hope it's another incredible experience! Good hiking and have fun, will be following along! Will Chris get to meet up with you occassionaly? Glad she made it to the start safely...will be following! Hi Max! So far so good for her, it's been rainy, cold, and windy in the desert so far...basically it's like she's never left the Whites, except for the breathtaking continuous views :) !! Looks thrilling , sorry its so cold ! This is great and I will check in on her progress. She is very lucky to have someone who is there to mail her stuff as she needs it and to update this page regularly. Kudos! Hey Chris! So happy ( and envious) of Whitney---so entirely different from climbing n the Whites---so what are you going to do all summer without your #1, top fav hiking partner?? How does one get 5 mos. off from work? that would work for me!! Your blog is the greatest!! ginny from Mass. Good stuff Whitney and Chris, keep the pics coming! The Appalachian Trail is still on my bucket list, I just don't know how I can take 5 months off from being with Patti. I don't think I'll ever do the PCT or the CDT though! Beautiful photos all ready!! Great to be able to follow along. The prep work and organization is amazing!